Vent harmful gasses from your frozen pond with the Allied Precision Pond Breather. Harmful gasses from decomposing matter and accumulated fish waste can be trapped under the ice in your pond and can reach toxic levels, possibly harming your fish and plants if not allowed to escape. 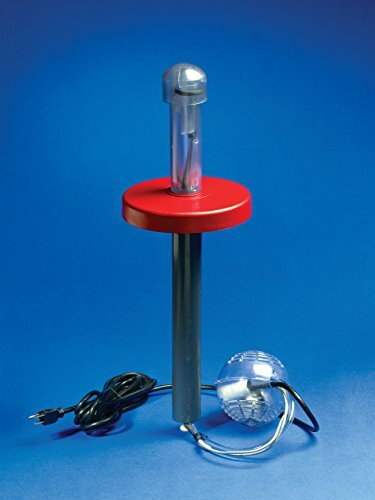 Rather than heating a hole in the ice, the revolutionary Pond Breather is designed to float in your pond, freeze into ice as thick as 15 inches, and move a steady stream of water above the ice layer where gas exchange can then occur. Operating on 120 volts and at an efficient 40 watts, the Pond Breather uses 31 times less energy than 1250 watt pond de-icers. Every 24 hours, the Pond Breather exposes 4,000 to 10,000 times more surface area of water than conventional heaters or de-icers. Supplying only enough heat to keep the water flow open, the Pond Breather creates a gentle current to move oxygen throughout your pond. Eliminate toxic gasses from your pond with the Allied Pond Breather. If you have any questions about this product by Allied Precision Industries, contact us by completing and submitting the form below. If you are looking for a specif part number, please include it with your message.